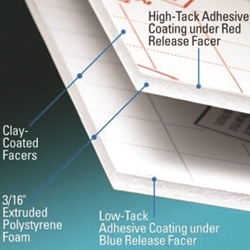 Fome-Cor® Self-Adhesive is comprised of extruded polystyrene foam with clay-coated paper facers, one of which is covered with pressure sensitive adhesive. Simply peel back the release facer as you position the graphic on the sticky surface. Made In USA.